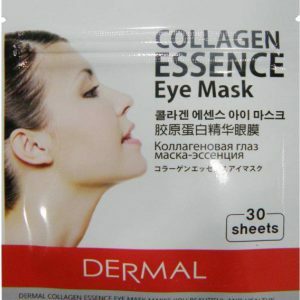 View cart “Dermal Korea Collagen Essence Eye Mask (30 Sheets)” has been added to your cart. Dermal Korea Collagen Essence Eye Mask contains collagen and arbutin which are very effective for keeping skin moist and soft also it effectively lightens and brightens dark circle under the eyes. Dermal Collagen Essence Eye Mask formulated with Arbutin, Snail Secretion Filtrate, Hyaluronic acids, Aloe vera gel, Dipotassium Glycyrrhizate, and etc. Dermal Eye Mask is a good treatment for dark circle, puffiness, dullness around the eyes. 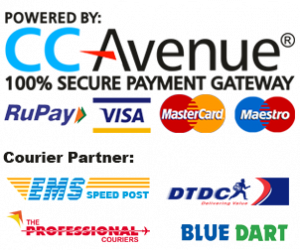 Volume: 15 pairs (30 sheets)/ 36g . Main Ingredients: Water, Glycerin, Butylene Glycol, Hydrolyzed Collagen, Arbutin, Aloe Barbadensis Leaf Juice, Snail Secretion Filter, Camella Sinensis Leaf Extract, Dipotassium Glycirrhizate, Beta-glucan, Panthenol, Tocopheryl Acetate, Polysorbate 80, Disodium EDTA, Xanthan Gum, Methylparaben, Fragrance. 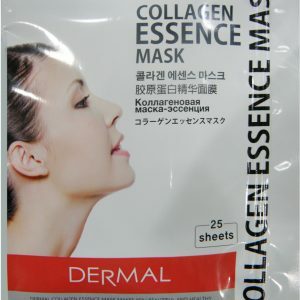 Dermal Korea Collagen Essence Mask is a sheet type mask which is made of pure essence. It contains lots of collagen and hyaluronic acids which are excellent for keeping skin moist and soft thus it keeps your skin always Clean, Smooth & Bright.
. Upzip the pack and take out the sheet.
. Smooth the sheet using fingertips to the position over your face.
. Lie back and relax for 15-20 minutes after applying the sheet.
. Removing the sheet gently and massage the remaining the essence until completely absorbed. Ingredients: Water, Glycerin, Butylene Glycol, Hydrolyzed Collagen, Sodium Hyaluronate, Aloe Barbadensis Leaf Juice, Snail Secretion Filtrate, Camellia Sinensis Leaf Extract, Dipotassium Glycyrrhizate, Beta-Glucan, Panthenol, Tocopheryl Acetate, Polysorbate 80, Disodium EDTA, Xanthan Gum, Methylparaben, Fragrance.